Matthew completed his PhD in 2017. His doctoral research was in the development of photonics integrated circuits for applications in large scale quantum networks. He is trained in integrated waveguide design, cleanroom fabrication and laser materials processing methods for fabrication, and device characterisation and packaging. His project was supported by the EPSRC scholarship “Quantum Lightwave Circuits” and his doctoral work was carried out under the supervision of Prof. Peter G. R. Smith and Dr. James Gates. Matthew graduated with a First Class MEng Degree in Electronic Engineering from the University of Southampton in 2013, with the GD Turner Sims Award for 3rd highest mark in the cohort. on completion of his doctorate Matthew took the position of Research Fellow at the Optoelectronics Research Centre, University of Southampton, UK. His research investigates the design and fabrication of planar Bragg gratings for applications in quantum science and sensing applications. Matthew is an active science communicator and passionate about “getting the science out of the lab”. He has contributed to raising close to £40,000 for outreach education and public engagement activities. 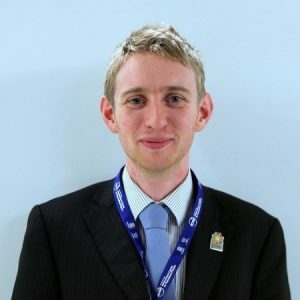 He has received awards for his endeavours, with most notable featuring the 2017 University of Southampton Student Union’s Award for Best Contribution to a Society and the 2015 South East England Physics Network Public Engagement Innovation Award. Matthew has been actively involved in the University of Southampton’s Optics and Photonics Society, which is comprised of an SPIE, OSA and IEEE Photonics Society student chapters. He served as chapter Student Mentor, President and 2 terms as Outreach Officer, where he directed the chapter’s Lightwave Roadshow, an outreach education and public engagement research programme. As Chapter Officer, he delivered a workshop for graduate students in student chapters on best practices for outreach delivery; this has been presented (in French and English) in 9 student chapters in research institutions in Canada and the USA, including Stanford University, University of Toronto and Polytechinque Montréal. Matthew is now working for Excelitas Technologies in Canada as a process scientist. Matthew is fluent in English and French, and proficient in Spanish and Mandarin. He is an early-career member of the SPIE, IEEE Photonics Society, OSA and IOP. In his free time, Matthew cycles, climbs and goes mountaineering.